This rarely seen engine is passing westbound through Altkloster station on a freight train, much of the goods destined for export, the produce and production of Bavaria and other eastern areas. It is 1950. Electric overhead was installed in this region before the war, but is now being expanded for improving locomotive development. Many freight trains carry equipment for the rebuilding of Germany. The railway is always busy, and a great time to get photos of engines and operations that will pass. 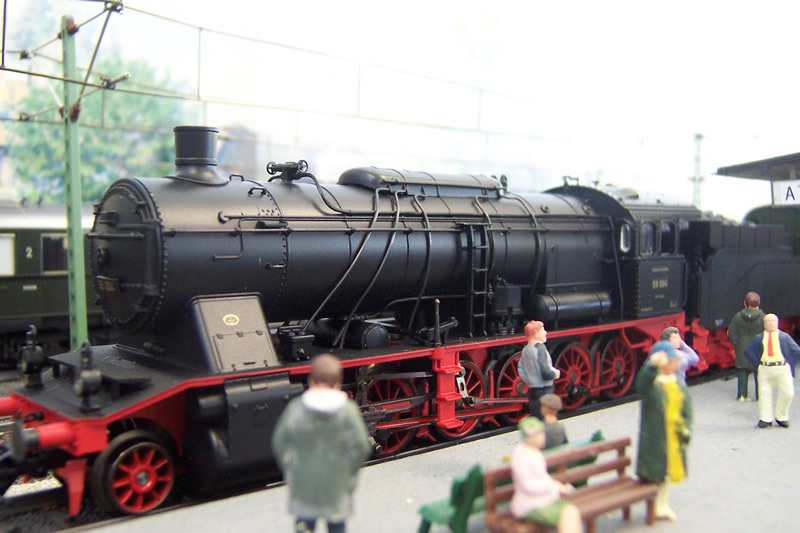 Maerklin model 37054. 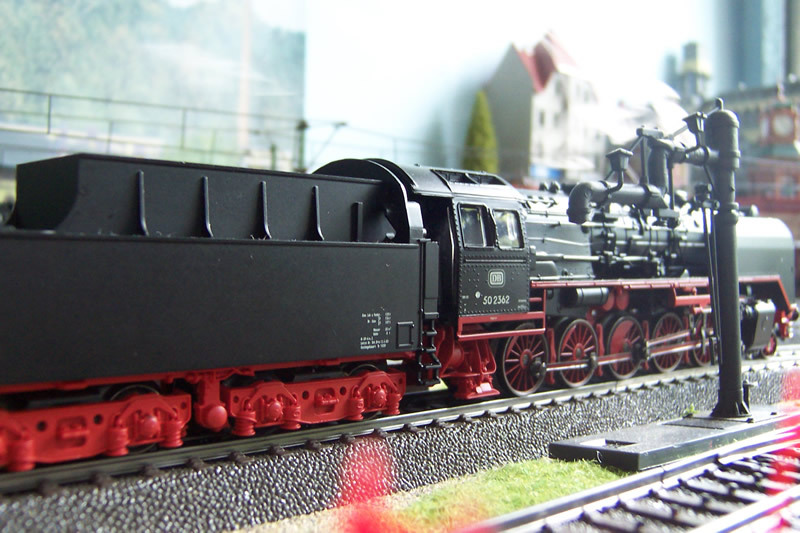 The 59 class 4 cylinder engine was one of 44 engines of 2-12-0 wheel arrangement built especially from 1914 by the Kingdom of Württemburg State Railways to handle heavy gradients. It is soon to be scrapped because its duties have been taken over by electric engines such as the E94. The 12 driving wheels were quite rare on world railways, and this class was the only known German example. Some of the engines ended up in Austria and other countries. The 50 class of 2-10-0 proved to be very capable machines, with many parts that were standard on other steam engines. This was one of the main engineering design philosphies of the DRG from 1920. The design was recognised in other countries, for example Great Britain, where the celebrated 2-10-0 standard design was introduced in the mid 1950s. This 50 class is pulling out of Altkloster in 1958, with a long freight for eastern areas of the province. In the background, are shops, boarding houses, and offices, in the elevated part of Altkloster town overlooking the railway station. I also have a picture of a similar engine used in Denmark from about 1952. There it was called the N class, and you can see it here.